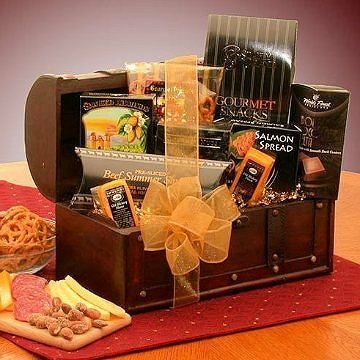 Gourmet Connoisseur Gift Chest. Act on your thoughtfulness for any reason at all, and your kindness will shine through with this gift chest of gourmet foods. The solid wood gift chest is filled with delicious treats and snacks and the gift box will last for years to come. This gift includes the following: Solid wood gift chest, 2 oz smoked almonds, 2 hickory smoked cheese bars, smoked salmon cracker spread, honey sweet peanuts, 1.5 oz pretzel twists, gourmet snack mix, and 3.5 oz vanilla caramels.